As a professional caterer, you know that speed is the key to success. The faster you can serve, the more parties you can book, the healthier your company gets. 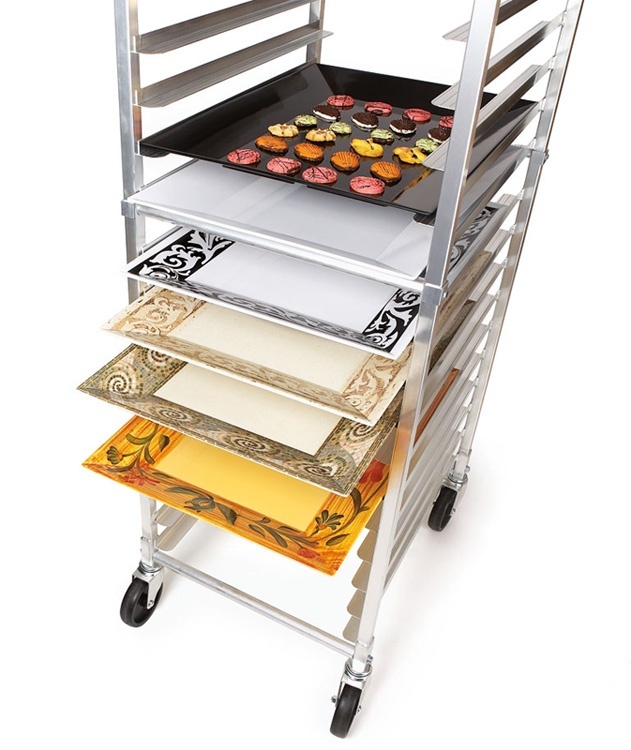 That’s why nearly any professional catering service uses speed racks: you tray up your food on aluminum sheet pans, put it on the speed rack, and out the door you go. However, once you get on-site, it’s fairly typical for operations to slow down because often caterers have to take their food off the sheet pans, re-plate it, and then serve. This step not only slows down your service but you also loose food temperature in the process. If you opt for melamine serving trays instead of aluminum sheet pans, you set yourself up to bypass this slow part altogether, allowing you to go from speed rack to service in seconds. Featured: Sheet-pan-sized melamine trays in a variety of trendy designs on a speed rack. Order samples. Melamine sheet pans, also called trays or serving trays, are the same size as their aluminum counterparts. This means you can use them on your existing speed racks in a one-for-one switch from aluminum sheet pans. But the real difference is that melamine sheet pans are designed to be guest-facing. So instead of having to slow down to re-plate as soon as you get on-site, your food is ready to serve the moment the truck pulls up. Done. It’s that simple. 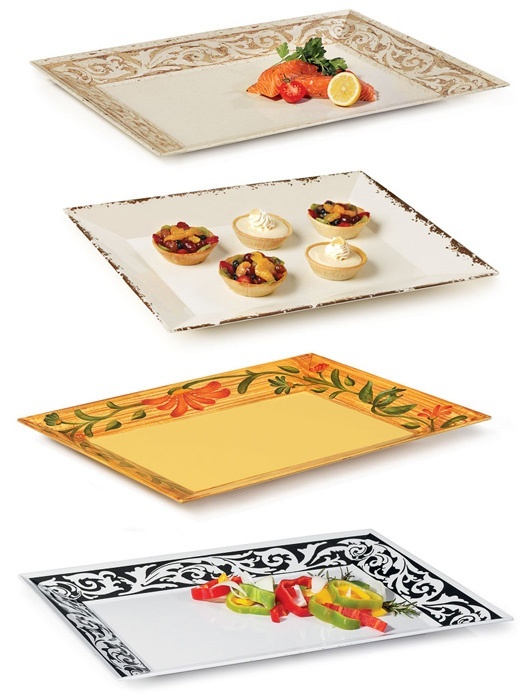 Even better, melamine trays are available in a range of styles appropriate for a formal wedding or a family reunion BBQ. You can easily find designs to fit any kind of service you need to provide. Further, at the end of service, you won’t have as many individual plates to clean up. And you’ll have plenty of tray space to put your used flatware, napkins, condiment cups, etc., on. And just like that, you’ve eliminated a whole time-consuming step from the front end of your service, and you can bus faster, too. Over the course of only a month, consider how much time and labor that can save you. You’d likely be able to take on a handful more bookings and grow your business all because you opted for guest-facing melamine trays. Each of those steps costs you money because (obviously) you have to pay for each tray. But beyond that, you also pay for the amount of storage space you need, cleaning products, utilities, and labor to clean the trays. If you decide to use melamine catering trays, guess what?! All of that redundant work goes away. You have one set of trays that will get you through your events beautifully and seamlessly. Additionally, melamine has one of the lowest replacement rates of some of the most popular foodservice materials. You only need to replace about 10%-20% of your inventory annually. By wisely choosing melamine trays for your catering service, you can count on them lasting for a handful of years and still looking great (so long as you take care of them, of course). Featured: Sheet-pan-sized melamine trays for catering. 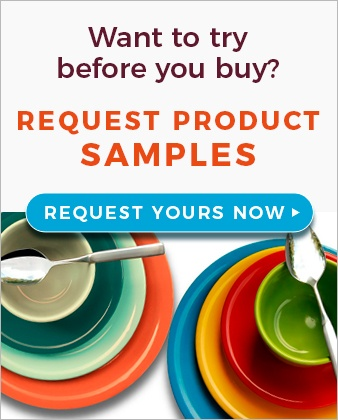 Order samples. On the food cost side, melamine serving trays can be placed in warming cabinets at 150°F (this gives you a buffer between the temp in the cabinet and the maximum temp for melamine, which is 200°F). Because you’re going directly from the warming cabinet to service, you won’t have to worry about tossing out food because it’s left the temperature safety zone. Keeping your food as hot as possible before service makes it look better, too, which means you’re offering a higher quality product to your guests. In turn, you may be able to charge a bit more. Melamine trays are starting to look pretty tempting for your operation, aren’t they? Let’s briefly take a look at presentations to give you a full picture of what you can achieve when you use melamine instead of aluminum sheet pans. Here’s where you can have a ton of fun and let your creative side shine (hard to do with aluminum sheet pans, right?). Like we mentioned earlier, melamine trays have myriad design options. From understated elegance perfect for weddings to the look of hand-painted accents for a sunny garden party and modern black and white designs for contemporary business events, you can attain an appropriate style for any service. You can even find half-sized trays with those same head-turning designs. They’ll still fit on speed racks for easy transport, too. If you use two half-sized trays, you have the opportunity to serve more than one dish using the same space you would have if you served on a full-size tray. Featured: Full and half-sized melamine trays for catering, half-sized tray with nooks for small plate dining and catering. Order samples. But your stunning presentations don’t have to stop at design and size. 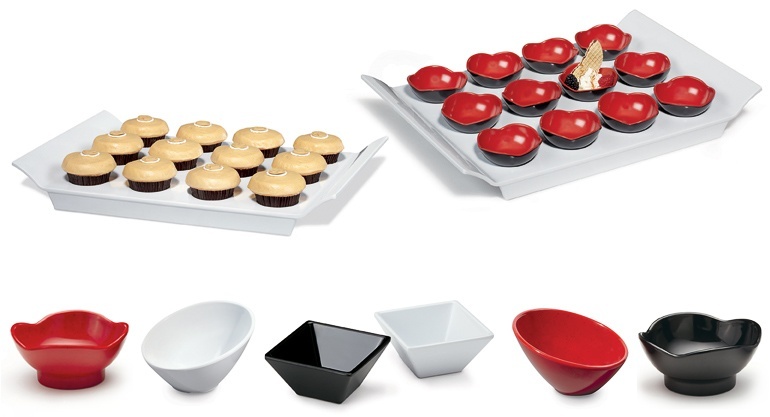 Check out the melamine trays below with little nooks where you can place mini dishes. These could not be more perfect for catering, and they add a unique, endearing tone to your presentation. Or, skip the bowls and make captivating cupcake displays, which many brides prefer as a modern alternative to a traditional wedding cake. Featured: Half-sized melamine serving trays with nooks and accompanying mini bowls with cascading, scalloped, flared, and squared rims. Order samples. 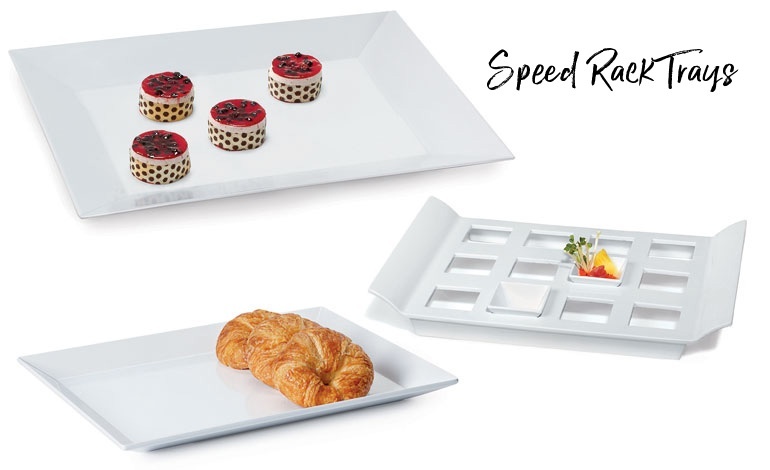 Melamine trays offer you so many fun, elegant, and modern options for creating engaging displays that your guests may be willing to pay a bit extra for your service. Not only do aluminum sheet pans keep these options from you, but they also cost you more time and money. Give melamine serving trays a try and see for yourself how much they can improve your catering operations. See your choices, and if you like what you see, you can order a sample. If you need some trays in a hurry to accommodate that extra booking, you can count on G.E.T. to ship within 24 hours of your order, and to be there for you even after it arrives should you have any questions. If you found this time-saving tip helpful, we recommend checking out "How to Minimize Catering Food Waste" for ideas about how to save some money.